Objectives: Granulomatosis with polyangiitis (GPA) affects respiratory system very often. In this report, we document the pulmonary manifestations and computed tomography (CT) findings in GPA patients. Subjects and Methods: We conducted retrospective study of GPA patients followed up at King Khalid University hospital, King Saud University, Riyadh, during the period 1990–2014. Various disease manifestations, X-ray and CT findings, therapy, and outcome in GPA patients with pulmonary involvement were retrieved. Results: Among 23 cases of GPA, 14 were males and 9 were females. Mean age at onset of disease was 42.1 ± 14.5 (range: 11–63) years. Respiratory tract was the most frequently involved system (82.6%); upper airways were affected in 56.5% and lungs in 65.2% patients. 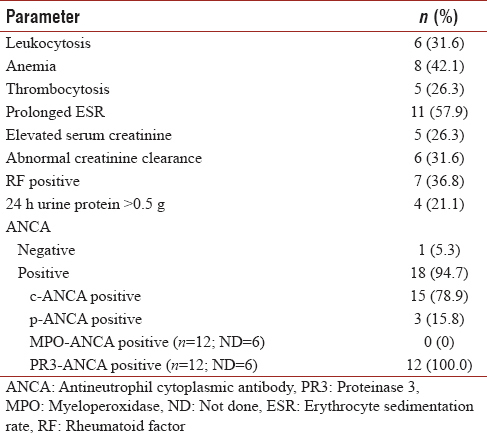 Among 19 patients with respiratory system involvement antineutrophil cytoplasmic antibody (ANCA) was positive in 18 (94.7%) patients; c-ANCA was positive in 15 (78.9%) and p-ANCA was positive in 3 (15.8%) patients. Chest CT findings in 15 patients showed that lung nodules were the most frequent pathologies, seen in 12 (80.0%) patients, and were cavitated in 8 (53.3%) patients. Airspace opacification was seen in 73.3%, air bronchogram in 20.0%, and ground-glass opacities in 33.3%. CT results at follow-up showed resolution of lung nodules in 9 (60.0%) patients. 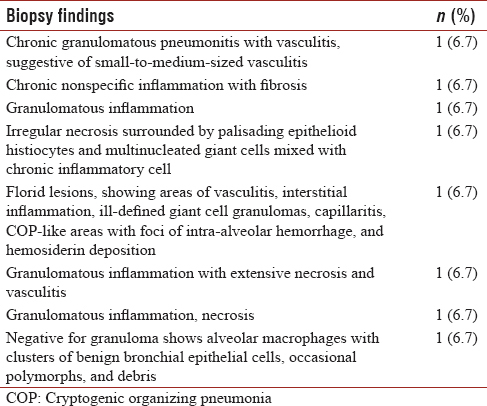 Lung biopsies showed chronic granulomatous inflammation with vasculitis and necrosis. 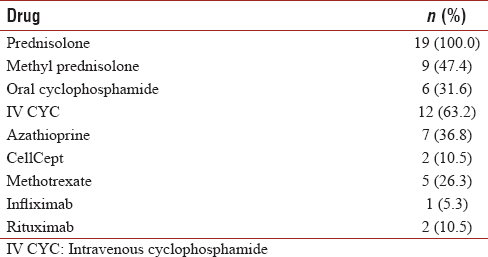 Intravenous cyclophosphamide was received by 63.2% patients and 10.5% required rituximab therapy along with other drugs. Conclusion: Respiratory system involvement in our GPA patients was similar to previous reports but with variation in certain parameters. Disease outcome was good, and lung CT at follow-up showed resolution of nodules with treatment. To our knowledge, there are no detailed studies on pulmonary GPA from Saudi Arabia. This study was undertaken to evaluate the disease manifestations, treatment, and outcome of GPA with pulmonary involvement in Saudi patients. A retrospective chart review of GPA patients treated and followed up in Rheumatology Clinics at King Khalid University hospital, King Saud University, Riyadh, during the period 1990–2014 was performed. Diagnosis of GPA was made as per Chapel Hill Consensus Conference definition of GPA. The study was approved by the Institutional Review Board of College of Medicine, King Saud University, Riyadh. The demographic data obtained included present age, age at onset of disease, gender, nationality, duration of disease, interval between onset of symptoms and diagnosis, and duration of follow-up. Hematological, renal, and immunological parameters were also collected. The method for testing antineutrophil cytoplasmic antibody (ANCA) was indirect immunofluorescence (for detecting c-ANCA and p-ANCA) and enzyme-linked immunosorbent assay (for detecting PR3- and/or MPO-ANCA). Upper airway involvement was evaluated by CT, magnetic resonance imaging of the upper airway wherever relevant as well as consultation to ear, nose, and throat specialists. Chest X-ray, chest high-resolution CT (HRCT), and lung biopsy findings were retrieved. The management of disease was carried out as per the latest published and accepted modes of therapy by the vasculitis communities across the world. Cyclophosphamide plus corticosteroids remain the most recognized and effective means of inducing and sustaining remission of GPA. Treatment given, complications encountered, and outcome were noted. Statistical analysis of the data was performed using IBM SPSS statistics for Windows Version 19.0. (Armonk, NY: IBM Corp) and presented as percentages and means. Twenty-three cases of GPA were identified. Of them, 14 (60.9%) were males and 9 (39.1%) were females (male:female – 1.6:1). Mean present age ± standard deviation was 46.5 ± 16.9 (range: 19–77) years and mean age at onset of disease was 42.1 ± 14.5 (range 11–63) years. Mean interval between onset of symptoms and diagnosis was 6.8 ± 10.5 (range 0–30) months, mean duration of disease was 8.4 ± 5.2 (range: 1–20) years and mean duration of follow-up was 5.1 ± 4.6 (range: 0.2–19) years. The system most frequently affected was respiratory, involving 19 (82.6%) patients as follows: upper airways in 13 (56.5%) patients and lungs in 15 (65.2%) patients. 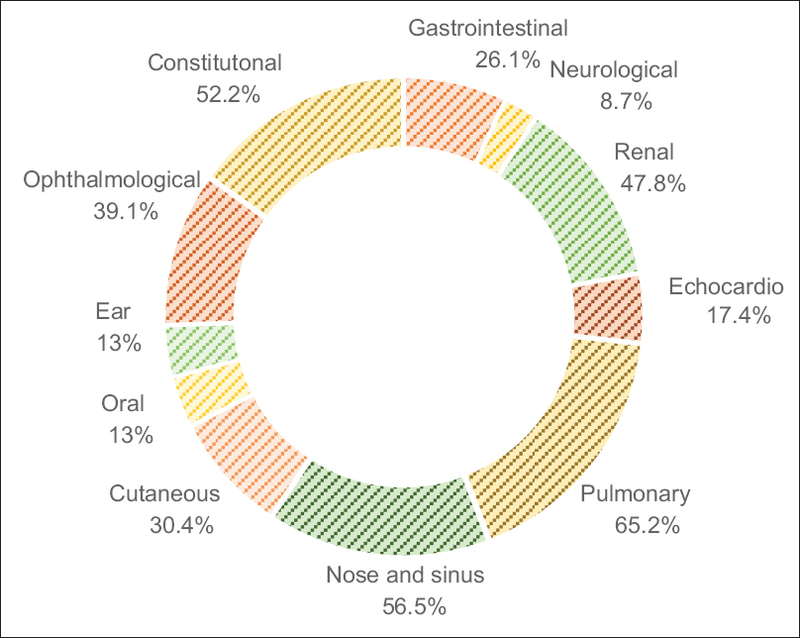 Constitutional symptoms occurred in 12 (52.2%) patients which consisted of fatigue, fever, myalgia, night sweats, anorexia, and weight loss [Figure 1]. Of the 19 patients with respiratory system involvement, 10 (52.6%) were males and 9 (47.4%) were females. Epistaxis was noted in 9 (47.3%) patients, nasal polyps in 3 (15.8%), nasal septum deviation in 3 (15.8%), sinusitis in 7 (36.8%), dyspnea in 13 (68.4%), cough in 15 (78.9%), chest pain in 7 (36.8%), and hemoptysis in 10 (52.6%) patients. Hematological and immunological investigations done in these 19 GPA patients with respiratory system involvement are presented in [Table 1]. Leukocytosis was observed in 6 (31.6%) patients, anemia in 8 (42.1%), and thrombocytosis in 5 (26.3%) patients. ANCA was negative in 1 (5.3%) patient and positive in 18 (94.7%) patients. In ANCA-positive patients, c-ANCA was positive in 15 (78.9%) and p-ANCA was positive in 3 (15.8%) patients. MPO-ANCA was negative in all 12 ANCA-positive patients tested for it (not tested in 6 ANCA-positive patients). PR3-ANCA was positive in all 12 ANCA-positive patients tested for it (not tested in 6 ANCA-positive patients). The X-ray and HRCT reports of the chest of 15 GPA patients with lung involvement are presented in [Table 2]. Nodules, either single or multiple, were the most frequent pathologies reported in 12 (80.0%) of them and were cavitated in 8 (53.3%) of them. Opacities included airspace opacification seen in 73.3%, air bronchogram in 20.0%, and ground-glass opacities in 33.3%. Pulmonary hemorrhage was seen in 2 (13.3%) patients. 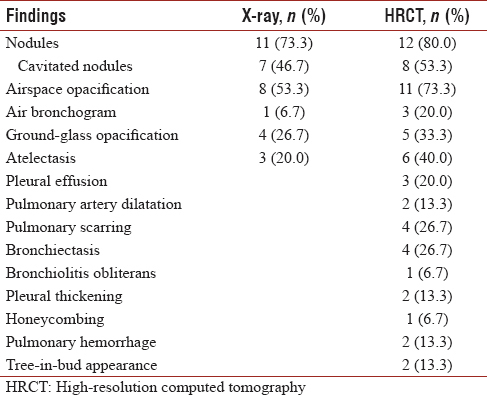 HRCT results at follow-up are presented in [Table 3], which shows resolution of lung nodules in 9 (60.0%) patients, while 20% nodules remained unchanged. Lung biopsy results are summarized in [Table 4]. The biopsies showed chronic granulomatous inflammation with vasculitis, irregular necrosis surrounded by palisading epithelioid histiocytes, multinucleated giant cells mixed with chronic inflammatory cells, florid lesions showing vasculitis, interstitial inflammation, ill-defined giant cell granulomas, capillaritis, with foci of intra-alveolar hemorrhage, hemosiderin deposition and alveolar macrophages with clusters of benign bronchial epithelial cells, occasional polymorphs, and debris. All 19 GPA patients with respiratory system involvement received oral prednisolone (PSL) [Table 5] and almost half of them (47.4%) received methyl PSL. Intravenous cyclophosphamide (IV CYC) was given to 63.2% patients, either 6 or 12 doses over a period of 12 or 24 months. Patients also received azathioprine (36.8%) and methotrexate (26.3%). Two (10.5%) of them required rituximab given as six doses over 12 months. Infections were reported in a total of 6 (31.6%) patients including pneumonia in two patients, septicemia in two, bacterial meningitis in one, and herpes zoster in one patient. Eight (42.1%) patients required hospitalization for disease flares and infections, two of them requiring intensive care. One patient was admitted for avascular necrosis of hip, two for pulmonary symptoms flare up, and five patients for infections. There were no deaths and all patients were on remission on treatment at the time of follow-up. c-ANCA was found positive in 78.9% of our patients similar to rates reported in literature. It is reported that >90% of GPA patients had c-ANCA while <10% had p-ANCA. PR3-ANCA was found positive in all the cases tested for it and MPO-ANCA was not positive in any of them. The prognosis of GPA patients was grave before institution of effective therapy. Administration of IV CYC improved the survival of patients in combination with oral and IV PSL., IV CYC was given to 63.2% of our patients, while in some studies, up to 95% patients have received it. The lower rate of IV CYC in our patients is because of inclusion of older cases dating back to 1990s where oral CYC regimen was the norm. GPA can be associated with significant morbidity and mortality without proper therapeutic management. As it presents with a cluster of diverse manifestations, knowledge of its presentation and disease course in patients from this region will be valuable in their proper management. Respiratory system involvement in our GPA patients was similar to previous reports but with variation in certain parameters. This is the first report on pulmonary manifestations of GPA from our region. Disease outcome in our patients was good and there were no deaths. HRCT at follow up showed resolution of nodules, opacities and other abnormalities in substantial number of patients with treatment which included pulse PSL, IV CYC and rituximab. Jennette JC. Nomenclature and classification of vasculitis: Lessons learned from granulomatosis with polyangiitis (Wegener's granulomatosis). Clin Exp Immunol 2011;164 Suppl 1:7-10. Yunt ZX, Frankel SK, Brown KK. Diagnosis and management of pulmonary vasculitis. Ther Adv Respir Dis 2012;6:375-90. Puéchal X. Antineutrophil cytoplasmic antibody-associated vasculitides. Joint Bone Spine 2007;74:427-35. Shin MS, Young KR, Ho KJ. Wegener's granulomatosis upper respiratory tract and pulmonary radiographic manifestations in 30 cases with pathogenetic consideration. Clin Imaging 1998;22:99-104. Lohrmann C, Uhl M, Kotter E, Burger D, Ghanem N, Langer M. Pulmonary manifestations of Wegener granulomatosis: CT findings in 57 patients and a review of the literature. Eur J Radiol 2005;53:471-7. Almouhawis HA, Leao JC, Fedele S, Porter SR. Wegener's granulomatosis: A review of clinical features and an update in diagnosis and treatment. J Oral Pathol Med 2013;42:507-16.
de Souza FH, Radu Halpern AS, Valente Barbas CS, Shinjo SK. Wegener's granulomatosis: Experience from a Brazilian tertiary center. Clin Rheumatol 2010;29:855-60. Griffith ME, Gaskin G, Pusey CD. Classification, pathogenesis, and treatment of systemic vasculitis. Ren Fail 1996;18:785-802. Matteson EL, Gold KN, Bloch DA, Hunder GG. Long-term survival of patients with Wegener's granulomatosis from the American College of Rheumatology Wegener's Granulomatosis Classification Criteria Cohort. Am J Med 1996;101:129-34. Ntatsaki E, Watts RA, Scott DG. Epidemiology of ANCA-associated vasculitis. Rheum Dis Clin North Am 2010;36:447-61. Ozbalkan Z, Kiraz S, Ozturk MA, Ertenli AI, Apras S, Calguneri M. Wegener's granulomatosis: Clinical and laboratory results of a university hospital study of 20 patients from Turkey. Clin Rheumatol 2006;25:358-63. Abdou NI, Kullman GJ, Hoffman GS, Sharp GC, Specks U, McDonald T, et al. Wegener's granulomatosis: Survey of 701 patients in North America. Changes in outcome in the 1990s. J Rheumatol 2002;29:309-16. Bajema IM, Hagen EC, van der Woude FJ, Bruijn JA. Wegener's granulomatosis: a meta-analysis of 349 literary case reports. J Lab Clin Med 1997;129:17-22. Koldingsnes W, Nossent H. Predictors of survival and organ damage in Wegener's granulomatosis. Rheumatology (Oxford) 2002;41:572-81. Khan AM, Elahi F, Hashmi SR, Mahida KH, Ingrams DR. Wegener's granulomatosis: A rare, chronic and multisystem disease. Surgeon 2006;4:45-52. Travis WD, Hoffman GS, Leavitt RY, Pass HI, Fauci AS. Surgical pathology of the lung in Wegener's granulomatosis. Review of 87 open lung biopsies from 67 patients. Am J Surg Pathol 1991;15:315-33.